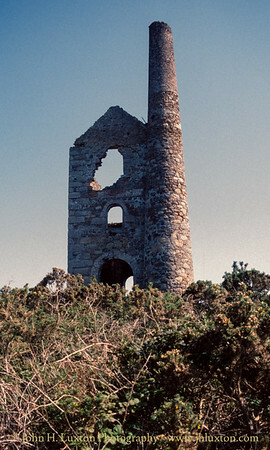 Wheal Peevor is located on North Downs about 1.5 miles north-east of Redruth. Cornwall. Work originally commenced around 1701 mining copper at shallow depths later switching to tin production in the late 18th Century. 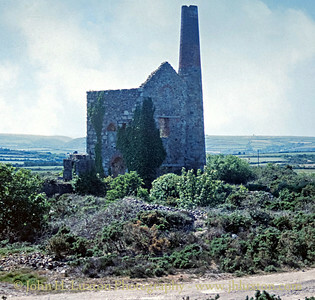 In the 18th Century, the mine was considered part of Great North Downs mine; it was opened separately in 1872 as Wheal Peevor. The mine closed in 1889, almost 20 years after the price of tin was depressed due to the discovery of large, easily mined deposits in the Far East. 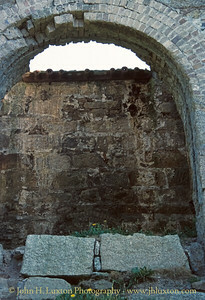 Some exploratory work was undertaken on the site on several occasions in the 20th century. 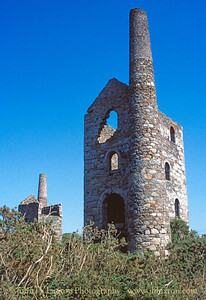 Significant conservation work was undertaken on the mine buildings, including the Grade II listed engine houses, in the early years of the millennium The is unusual because it contains the remains of three engine houses: the largest engine, with a 72 inch cylinder, was used for pumping water out of the mine; the second, used for winching material in and out of its shaft was at the eastern side of the sett; and the third with a 32 inch engine operated 48 heads of Californian stamps for crushing the ore. Wheal Peevor is now part of the Mineral Tramways Project and the Cornwall and West Devon Mining Landscape World Heritage Site. 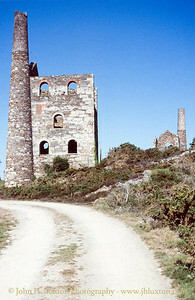 General view of the three engine houses at Wheal Peevor as which form a familiar sight to those travelling along the A30 near Redruth. From left to right stamps, pumping and whim engine houses. Wheal Peevor Sir Frederick's Shaft Pumping Engine House showing the significant storm damage which had been inflicted on the building the previous winter and which was thought to be putting the future of the structure in doubt at the time. The buildings were conserved and consolidated around 2005. 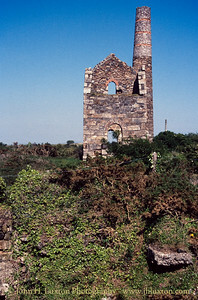 Wheal Peevor Pumping Engine House showing the significant storm damage which had been inflicted on the building the previous winter and which was thought to be putting the future of the structure in doubt at the time. Pumping engine house with the whim engine house on the right. 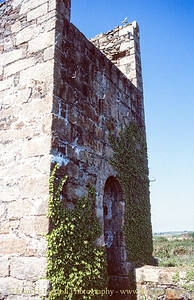 Bob wall of the pumping engine house. 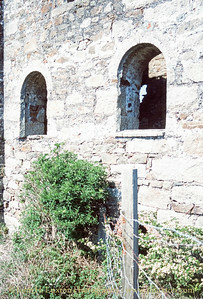 Pumping Engine House window detail. View into the pumping engine house taken with a telephoto lens from a safe distance. Note the surving ironwork on the bob wall. 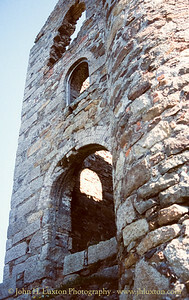 Winding (whim) engine house, from engine shaft. 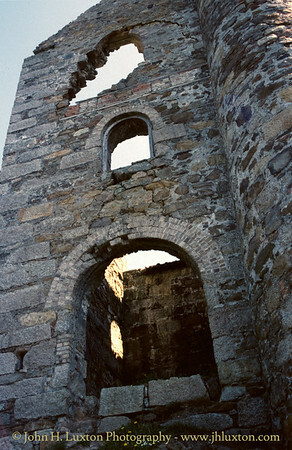 Wheal Peevor Pumping Engine House showing the significant storm damage which had been inflicted on the building the previous winter and which was thought to be putting the future of the structure in doubt at the time. The whim engine house can be seen to the left. 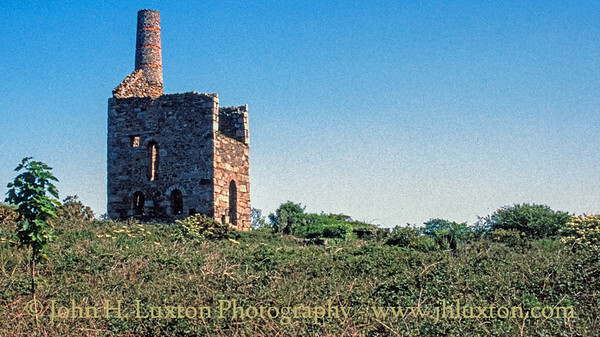 Wheal Peevor - Stamps Engine House. Wheal Peevor whim engine house.